Jenn Air ovens consist of single- or double-wall ovens which feature a self-cleaning cycle to eliminate the need for harsh oven cleaners or tiresome scrubbing. 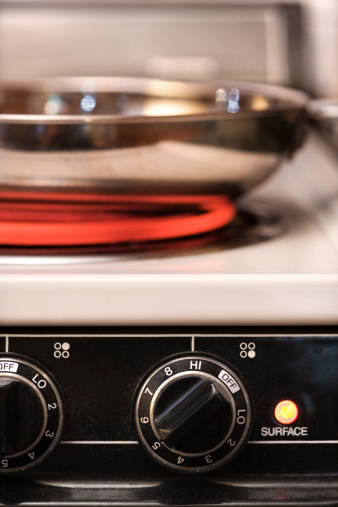 While the self-clean cycle uses high temperatures to burn away most messes, you should still wipe up any food spills or splatters which occur during cooking or baking as soon as possible to keep your Jenn Air oven looking new. Remove the oven racks and broiler pan from the Jenn Air oven and scrub them clean with hot, soapy water and a steel-wool pad. Rinse and dry the oven racks and broiler pan but do not place them back inside the oven. Clean the inside edges of the oven door frame and the first 1.5-inches of the oven cavity with a sponge dampened in warm, soapy water. Wipe away any food crumbs or loose debris from the oven cavity at this time. Remove the temperature probe and any aluminum foil or baking pans from the oven. Close the oven door. Press the button labeled "More" on the bottom, right-hand side of the display screen on your Jenn Air Oven. Press the button directly to the right of the words "Self Clean," which will appear on the display screen. The display screen will advise you to remove all pans from the oven and clean the inside of the oven door frame. Press "Next" on the display screen. This will display the different self-clean cycles ranging from two to four hours. Choose the shortest setting for a relatively clean oven and the longest setting for a very dirty oven. Press the "Start" button located at the bottom of the display screen. Wait for the self-clean cycle to end. Be aware that the oven door will remain locked while the oven cools down for approximately one hour after the cycle is complete. Remove any ash from the interior of the oven with a damp cloth after the oven has cooled completely. Clean the exterior window of the oven door with glass cleaner applied to a soft cloth. Clean the rest of the exterior with all-purpose cleaner and a soft cloth. If your Jenn Air oven is stainless steel, rub gently in the direction of the grain to avoid damaging the finish. How do I Fix a Locked Frigidaire Gallery Oven?